Today to celebrate what would have been Max Pertuz’s 100th birthday, we examine the structure of haemoglobin for which Perutz shared – with John Kendrew – the 1962 Nobel Prize for Chemistry. Haemoglobin is an iron-containing oxygen carrier protein that transports oxygen from the lungs to elsewhere in the body and which when associated with that oxygen gives our blood its characteristic bright red colour. To examine the structure of haemoglobin, Perutz and colleagues isolated the protein from horse blood which is abundant in haemoglobin1; horses typically have a haemoglobin concentration of ~150 g per litre of blood. By comparison in the modern day lab scientists producing recombinant protein (via a process of co-opting bacteria or other cells to produce large amounts of proteins that they don't normally produce) usually have to work very hard, growing tens of litres of culture to produce just milligrams (i.e. one thousandth of a gram) of protein for experiments. Hence, in these early days of protein science, horse blood provided a ready source for Perutz and co. to study. Extensive investigation of the structure of haemoglobin has revealed much about the intricacies of oxygen binding and release. Haemogoblin is made up of four subunits, each of which contains an iron-containing heme group. Remarkably, binding of oxygen to iron in one subunit directly increases the propensity of another of the subunits to bind oxygen, meaning that as the protein binds oxygen it becomes easier to bind more oxygen. 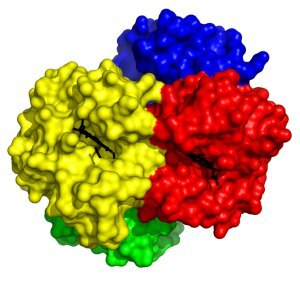 This so-called co-operative binding is pivotal to the efficiency with which haemoglobin can be loaded with oxygen and was the first time such an allosteric phenomenon was observed in proteins. This structure is of human deoxyhaemoglobin 2 i.e. haemoglobin without oxygen bound. Each of the four subunits is coloured differently, with the oxygen binding heme groups shown in black. This structure is Protein Data Bank ID 2HHB.